Yes, I know it’s now September, but I got my August Bonjour Jolie box today, since they’re timed to your cycle. In case you don’t know, Bonjour Jolie is a “time of the month” box, sending you your supplies along with gifts, treats, and fun things. 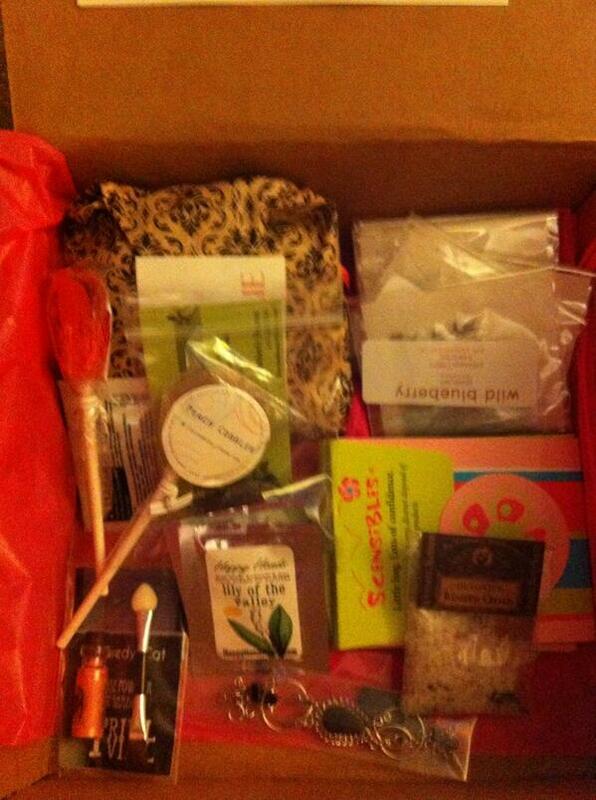 The theme of the August box is “Honoring the Feminine” and all the products came from women owned businesses. As you can see, it’s packed full of goodies. The bracelet is very beautiful — hand crafted from silver and semi-precious stones by women in Peru. There were lots of different colors apparently, mine is black. It’s not something I’d personally wear, but it will make a great Christmas present for my sister. There were two lollipops from Leccare Lollipops — peach cobbler and watermelon. The watermelon one looks like a giant Jolly Rancher. I hope it tastes like one. Five tea bags in yummy flavors (like chocolate and mint) from Just Add Honey Tea Company also came in the box. They smell delish. Bunny already tried the mint and she liked it. Organic hand scrub from Beazers Garden — this smells SO yummy, I sort of want to eat it. This is ALL MINE! Happy Hands Lotion — there are two little packets. I’m not a big fan of foil sample packets. But, since they’re for knitters, I’ll put them in with my mom’s birthday present. She might like them for her purse. Scardey Cat Mineral Eyeshow — I LOVE the tiny little bottle of this powder eyeshadow and the little brush that came with it. It’s a pretty pink, too. I’m not much of an eyeshadow wearer, but this will be cute tucked into a gift. Yummy smelling bath salts from Barefoot Apothecary — I love bath salts and bath bombs and wish they’d have more bath stuff! Two little Sensibles Sanitary Bags — this is an interesting idea, they’re to dispose of, well, you know. Then there are the (feminine) goods. I was quite pleased with last month’s selection and the amounts were generous, so I’m sure this month will be the same. There was a little packet of Advil in there, too. The value of the box is $27 PLUS the cost of the feminine products. Considering the box is $16 (plus $5 shipping), I think it’s a great value. I really like Bonjour Jolie, not only does it eliminate the need to run to the store last moment, but it’s filled with fun items to try. I look forward to seeing what’s in next month’s box. « Halloween Event — bloggers wanted! I'm a domestically awkward working suburban mom who's trying to take time to enjoy the sweet things in life. I like to try new things, bake, read, write, craft, and always have time for a hug. Over-educated, team oxford comma, and a member of the junior league. Disclosure -- most of the things I talk about here are bought with my own money. In the event I'm given something to review I'll tell you. Sometimes I use referral links.